Women must stop marrying the men who are programmed to dominate them by their wrong upbringing. Women are burdened everywhere with all sorts of unpaid household responsibilities that go unpaid. Through ages across all societies, they bear very disproportionate burden of unpaid labour like fetching water and firewood from faraway places, cooking and cleaning for whole family and guests to taking care of all children and elderly. Such unpaid workloads amounts almost half of the world economy. Despite this, most of the women do not have any independent income. Unpaid workloads upon women remain many times higher than on men anywhere. This unjust situation is alike in developing and developed countries. Therefore emancipating women from this yoke of unpaid workloads might earn enough in every political economy on planet earth. Even the most untoward circumstances cannot stop women from earning independently via SANGKRIT.net when they start working as people’s personal outlet, distributing and developing the internet growth to everyone around. Working like this is possible from anywhere on planet earth. Moreover this gives women their most necessary change. They meet the men, who clean and cook as well. Since without any discrimination such as sexual consideration, Sangkrit encourages everyone to take all cleaning and cooking responsibilities equally very much like blogging and programming. Upgrading humankind like this into internet age ends all discrimination. Thus Sangkrit is the program that actually emancipates women. The word ‘Sangkrit’ literally means an all-inclusive execution. Dominantly populating planet earth by making more and more Sangkrit households would become very much possible if women stop marrying the men, who are programmed to dominate them by their wrong upbringing. Instead marrying the men, who truly cooperate in everything shall serve the purpose of preparing a free future. Having an algorithm that works, a program successfully reigns in its framework. Primarily being a program, Sangkrit reigns respecting the very human nature as made explicit here definitely in this single sentence. when you train them for following their free will as only revered revelation other than practicing necessary programming languages for developing their domains as publicly useful private properties in a course of changing the world by building family net worth. If you believe this, you must behave thus. Make your quantum revolution from home to homepage. 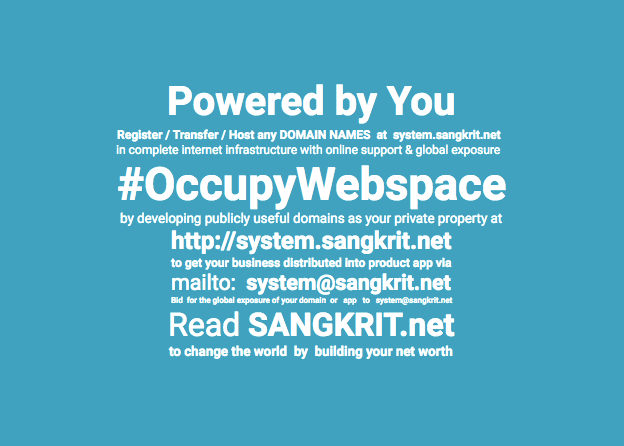 To startup now, signup for your free SANGKRIT.net account. This makes the hacktivist movement that is going to govern the globalization through internet age, is literally called Sangkrit as it means for ‘all-inclusive execution’. Following Sangkrit, your time and attention remain intact for your family like all your assets that you create from your home to homepage. The educated elite very smartly plunders mostly public money for private luxury and rules over the deprived people, who if steal for livelihood by breaking into their homes or stores, mostly end up in jail or get killed in encounter. Poor people mostly do not understand any ways to prosper. They live miserably. They go beyond the laws of land only to make their ends somehow meet and end up in prison, where some of them find it more systematic than their ghettoed neighborhood. They derive a sense of pride for ending up there and considering that as civilization start becoming hardened criminals. On the contrary the educated elite very smartly plunders mostly public money for private luxury and rules over the deprived people, who if steal for livelihood by breaking into their homes or stores, mostly end up in jail or get killed in encounter. Only poverty or prison awaits them till they perish away from planet earth. Most of the people across all the countries alike are deprived of any success like that. If you were born poor but yearn to avoid ending up in poverty or prison, you should start following the code of Sangkrit. Sangkrit has paved a way for them too to learn, earn and govern this world simply by cleaning, cooking, coding and blogging. Personal outlets of SANGKRIT.net help them to homeschool in this course that is quite affordable to them as well so that the best of them successfully become domainers, bloggers, programmers and investors also. Internet industry has great potential for facilitating like that. If you were born poor but yearn to avoid ending up in poverty or prison, you should start following the code of Sangkrit. It is the movement about your liberation. You get involved to become a free man or free woman making many others also free to disallow any plundering of public money aggregated from taxpayers and stockholders.